That’s a ton of great stuff. From PHP 5.2 support to greatly improved multi-site support, to tweaks and cleanup in the theme CSS ids there’s pretty much something for everyone in there. 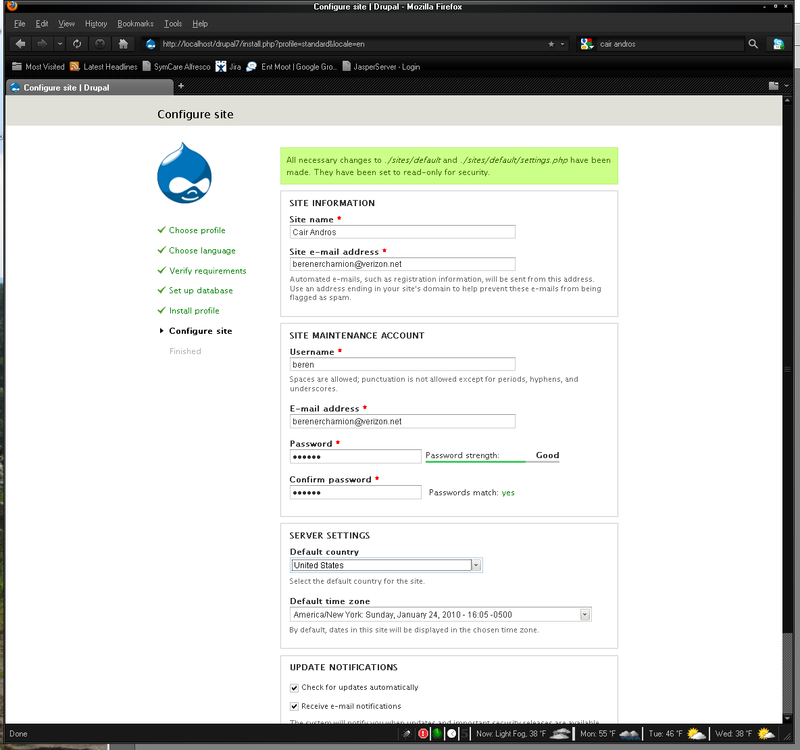 I did a quick install of Drupal 7 about a month ago and then yesterday did an update to the latest dev release from 15-Feb-2010. The basic mechanics of the install have not changed much – get a webserver, get a database, get php, get that all working and then install drupal using the included instructions. Look at previous posts here or go to drupal.org and read up. Both installs went smooth – there are simple minor changes and visual enhancements to the installation process. After the installation is complete the familiar Garland theme and the basic Drupal site is ready to go – at first it seems fairly anticlimactic. Could it have really worked? Well a quick login and you immediately can see – yes there’s the new administrative interface with all the JS overlays. 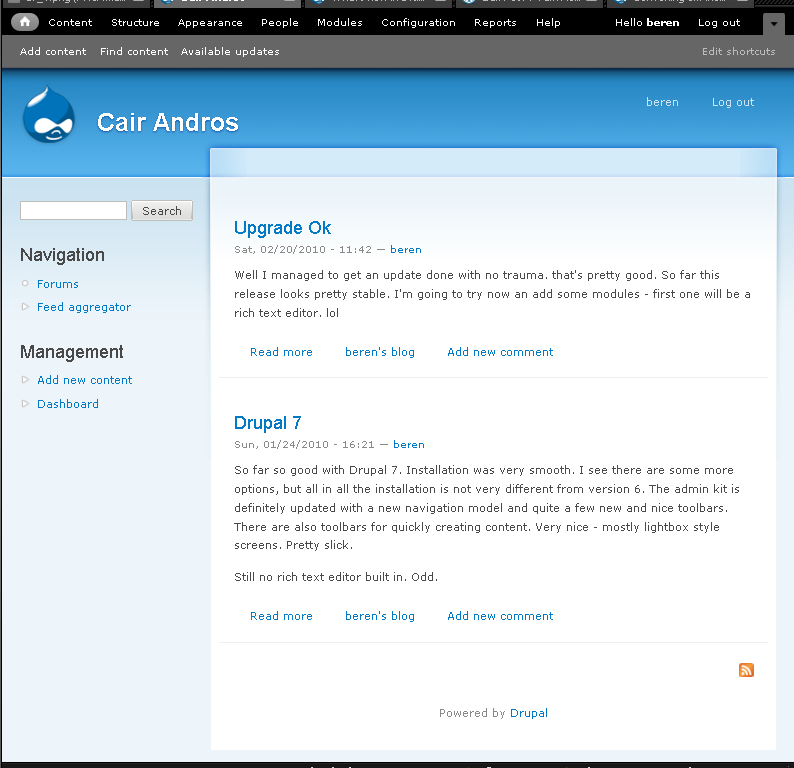 In the capture to the right you can see the menus’ when logged in as the base drupal user. The admin interface is completely revamped from D6 and after some initial head scratching I can say that it is a dramatic improvement. the top menu bar gives you quick access to the main areas of administration and the second bar is a shortcut bar that you can control. That’s a very good idea. I always like quick access to the updates features since I test a lot of pre-release themes and modules. Sections inside the admin tools make extensive use of jQuery lightbox and popup screens to reduce a lot of the clicking around required in D6. Here’s a thumbnail of the themes management screen. You can enable, config, and adjust your themes from the popup and still have quick access to the other areas within the admin kit. Adding content uses the same types of dialogs and forms. For such a simple change it really make the process of content creation much easier and more intuitive. What more is there to say? Well I think you need to dig around in the system and look at it yourself. Personally I think its a great release – good job Drupal team! Now onto the fun stuff – let’s see what’s up with themes! 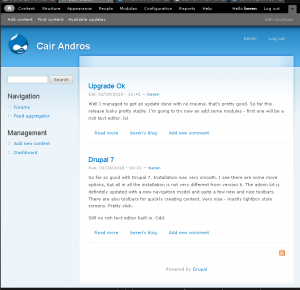 What changed with Drupal 7 themes? Now that Drupal 7 is coming out I’ll need to update my Troopers theme and of course finally come out with my Saab Turbo-X theme. Use the search box at the bottom of my blog to find the Troopers. There’s a ton of good info on the Drupal site here about changes in themes. Oh, but wait a minute – what can we use to develop with. Last time around I used a variety of editors and IDEs, but I was never all that satisfied. Well these days Aptana Studio is the way to go. You can grab that tool, its free, install it, add in the PHP tools, and then add a few extensions as PHP files and you will be good to go – check the instructions here: http://drupal.org/node/75242. The most important step is to make sure all the usual Drupal file extensions are registered as PHP extensions and of course to make sure that you have installed the Aptana PHP plugin. 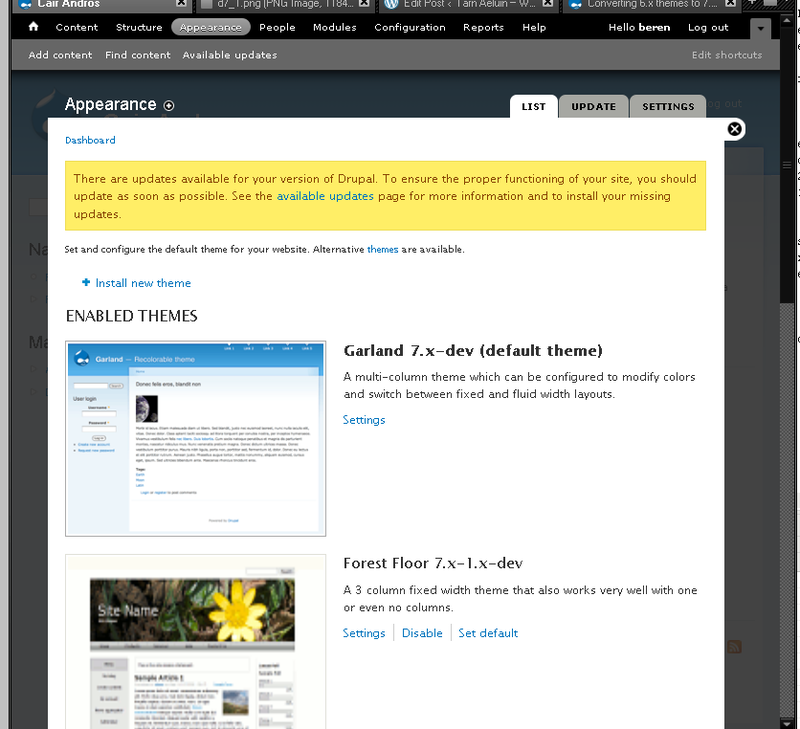 With that we are ready to go with Drupal 7 themes, but that will have to wait for my next post…by then D7-A3 should be out too. Sorry – I don’t allow plugging/advertising on my blog…if anyone is interested google on PHP IDE drupal…and you’ll get the link in the first page.